A slim body, excellent state of health, self-confidence - those factors that attract modern women. Unfortunately, the rhythm of the city's life does not always have a beneficial effect on our shape. Much needs to be done at work and at home, but there is little time left for yourself. 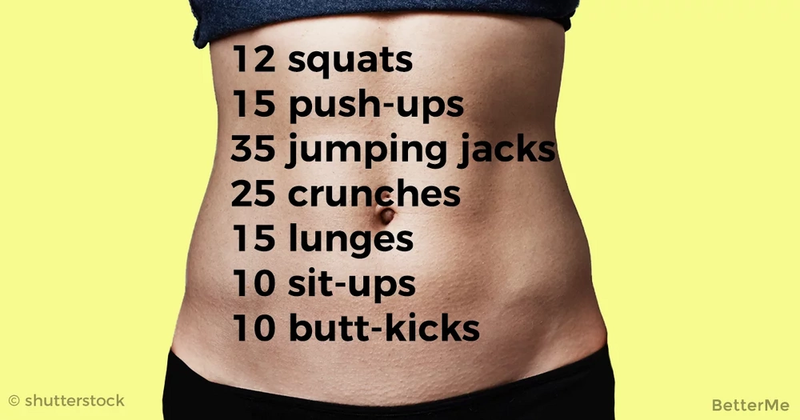 Recently, more and more often people are interested in the possibility of doing sports at home and so the internet search "fitness for beginners at home" is especially relevant. Fortunately, to the help of women comes the Internet, which gives us the opportunity to read different articles and find most effective exercises. Today I'm going to show you simple workout plan doing which can help create the new body in 10 weeks. All you need is the desire to change and some free time. - Stand with your feet hip width apart. Your toes should be pointing straight ahead or only slightly outward. - Cross your arms in front of your body, place your hands behind your head (prisoner squat) or at the sides of your head. - Keep your weight on your heels and bend your knees while lowering your hips towards the ground as if you are sitting down on a chair. - Keep your back straight at all times. - Continue until you feel a slight stretch in your quadriceps. Pause for a count of one. Do not let your knees extend out beyond the level of your toes. - Return to the start position by pushing down through your heels and extending your hips forward until you are standing straight. Repeat. - Position yourself on all fours on a mat. - Place your hands in front of you and shoulder-width apart. - Now bring your hands in towards the center until the tips of your index fingers and tips of your thumbs are touching. This creates a diamond shape between your hands. Your elbows and wrists should be in line with your chest. - With your fingers facing forwards, lift off your knees so that your body forms a straight line and just your hands and toes touch the floor. - Keep you pelvis straight and abs engaged and aim to keep a straight back throughout the movement. - Bend your elbows and lower your body towards the floor, aiming to touch your chest to the top of your hands. Pause briefly. - Return to the starting position by extending your elbows and lifting your body off the floor again. - Stand with your feet together, arms fully extended with your hands by your sides. This is the start position. - Bend your knees slightly then straighten and push through the balls of your feet while straightening your your knees to jump up spreading your legs to wider than hip width apart. - As you do so, raise both arms out and up in a smooth arc until your hands meet above your head. - As you return to the ground, bring your feet together and your hands back to your sides with your arms fully extended. - Continue without pause for the desired amount of time or repetitions. - Lie flat on your back with your feet flat on the ground, with your knees bent at 90 degrees. Alternatively, you can place your feet up on a bench a few inches apart with your toes turned inwards and touching. - Place your hands lightly on either side of your head. - Keep your elbows in so that they are parallel to your body. - Push your back down flat into the floor to isolate your abdominal muscles. - Gently curl your shoulders forward and up off the floor. - Continue to push down into the floor with your lower back. - Raise your shoulders about four to six inches only. 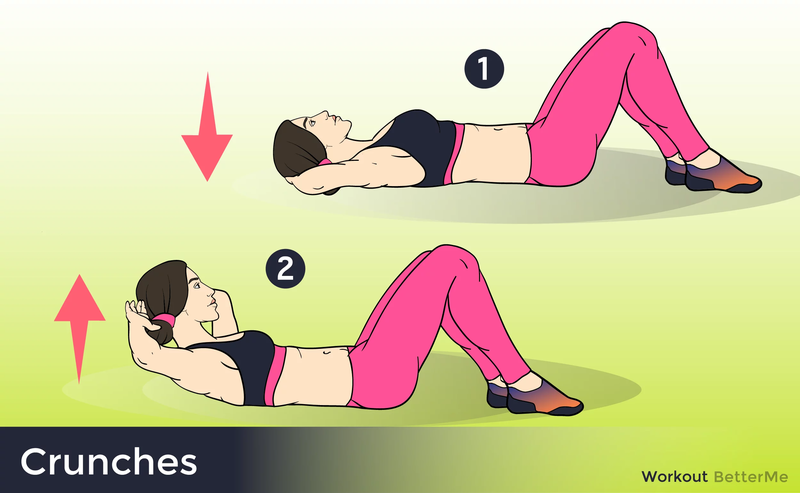 - Hold and squeeze your abdominal muscles for a count of one. - Return to the start position in a smooth movement. - Stand upright with a tight core and flat back. Extend arms to chest level in front of you. - Step forward with one leg. Front thigh should be parallel with the floor. Drop the back knee. - Rotate the torso towards the leg that stepped out while keeping arms extended. Push back up to the starting position. - Lie on your back. Bring your knees up to a 90-degree angle. Shins should be parallel to the floor. Place your hands behind your head and bring your shoulders off the ground. - Exhale and contract your abdominals. Bring your head towards your knees while moving your knees toward your chest. - Pause and return to the starting position. - Position your hands underneath your shoulders and place your knees under your hips. - Keep your right knee bent at 90 degrees and flex the foot as you lift the knee until it is level with the hip. - Lower the knee without touching the floor and repeat the lift. - Once you’ve completed the reps on the right leg, switch legs. - Get into a face down position on the floor supporting your upper body on your forearms. Your elbows should be bent at 90 degrees. - Extend your legs straight out behind you, supporting them on your toes and balls of your feet. - Keep your body in a straight line by tightening your abdominal and oblique muscles. - Hold for as long as possible.